BASSETERRE, St. Kitts, October 18, 2018 (Press Unit in the Office of the Prime Minister) – In what was a jubilant and well attended presentation ceremony on Wednesday (October 17), eighty-five (85) primary school students joined the list of the hundreds of children from Constituency Seven who have benefited from Prime Minister Dr. the Honourable Timothy Harris’ Help-a-Child Programme. 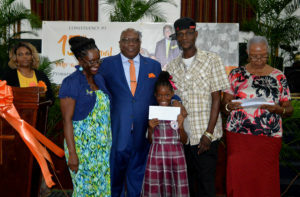 The 15th Help-a-Child Programme scholarship awards ceremony was held at the Mount Carmel Baptist Church in Bourryeau and saw $500 in bursaries being presented to 85 students from the four primary schools in Constituency Seven, as well as children of the Cotton-Thomas Comprehensive School, and students who reside in the constituency but attend school elsewhere. Bringing greetings from the Ministry of Education, Permanent Secretary Mr. William Hodge, commended the efforts of Prime Minister Harris for contributing directly to the education of the nation’s youths. Mr. Hodge told the 85 scholarship recipients that this gesture by the prime minister wouldn’t amount to much without their own commitment to their education. “It depends on your attitudes; it depends on your willingness to listen, to obey and be respectful. It is up to you to do your homework; it is up to you to get good grades on your tests. So when your teachers are teaching they can pull out all the stops, all the creative methods to get you to learn but in the final analysis it depends on you to ensure that you are successful,” Mr. Hodge said. Permanent Secretary Hodge revealed that he became a proud contributor to the scholarship programme after being inspired by last year’s ceremony. In his remarks to the diverse audience that gathered, Prime Minister Harris recalled the many assistance he received from family members, family friends and his teachers that helped him along his educational journey. Dr. Harris won the University of the West Indies annual scholarship award to pursue his studies at the UWI Cave Hill Campus in Barbados. There, he earned a First Class Honours degree that helped him secure support from the UWI that enabled him to attend the St. Augustine Campus in Trinidad. The prime minister’s performance there led to him being awarded a Post Graduate Award by the Central Bank of Trinidad and Tobago and after completing his Masters Degree with a distinction, the UWI provided him with the resources through its partnership with CIDA to pursue a PhD programme in Administration, majoring in Accounting. 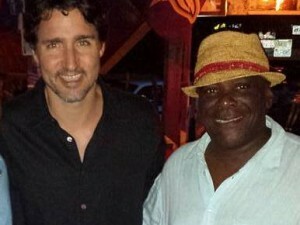 Prime Minister Harris said the Help-a-Child Programme then was born out of his own experience as a young man. “When I look back at my own life from where I was [to] what I have become, all throughout my educational journey someone stood by me, someone supported me and that is why it had became easy 15 years ago when I sat with my planning committee to determine how we could impact the constituency in a positive way and we said let us introduce what we then described as the Help-a-Child programme,” stated the Constituency #7 Parliamentary Representative. 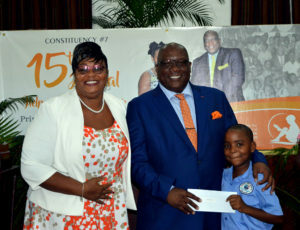 The $42,500 in bursaries presented to the 85 students on Wednesday brought the total amount awarded to date under the Help-a-Child programme to $294,000.00 and the total number of awardees to 588. The honourable prime minister also presented gift vouchers to the four primary schools in the constituency, namely, Violet Petty Primary, Joshua Obadiah Williams Primary, Estridge Primary School in Mansion Village and the Edgar T. Morris Primary School, as well as the the Cotton-Thomas Comprehensive School.